The name of God most often used in the Hebrew Bible is the Tetragrammaton (YHWH יהוה). It is frequently anglicized as Jehovah and Yahweh and written in most English editions of the Bible as "the Lord" owing to the Jewish tradition increasingly viewing the divine name as too sacred to be uttered. It was thus replaced vocally in the synagogue ritual by the Hebrew word Adonai (“My Lords”), which was translated as Kyrios (“Lord”) in the Septuagint, the Greek version of the Hebrew scriptures. Rabbinic Judaism describes seven names which are so holy that, once written, should not be erased: YHWH and six others which can be categorized as titles are El ("God"), Eloah ("God"), Elohim ("Gods"), Shaddai (“Almighty"), Ehyeh (“I Will Be”), and Tzevaot ("[of] Hosts"). Other names are considered mere epithets or titles reflecting different aspects of God, but chumrah sometimes dictates special care such as the writing of "G-d" instead of "God" in English or saying Ṭēt-Vav (טו, lit. "9-6") instead of Yōd-Hē (יה, lit. "10-5" but also "Jah") for the number fifteen in Hebrew. The documentary hypothesis proposes that the Torah was compiled from various original sources, two of which (the Jahwist and the Elohist) are named for their usual names for God (YHWH and Elohim respectively). The seven names of God that, once written, cannot be erased because of their holiness are the Tetragrammaton, El, Elohim, Eloah, Elohai, El Shaddai, and Tzevaot. In addition, the name Jah—because it forms part of the Tetragrammaton—is similarly protected. Rabbi Jose considered "Tzevaot" a common name and Rabbi Ishmael that "Elohim" was. All other names, such as "Merciful", "Gracious" and "Faithful", merely represent attributes that are also common to human beings. An early depiction of the Tetragrammaton: a passage of the Ketef Hinnom silver scrolls with the Priestly Blessing from the Book of Numbers (c. 600 BCE). The Tetragrammaton in Paleo-Hebrew (fl. 1100 BCE – 500 AD), Aramaic (fl. 1100 BCE – 200 CE), and modern Hebrew scripts. Portion of column 19 of the Psalms Scroll (Tehilim) from Qumran Cave 11. The Tetragrammaton in paleo-Hebrew can be clearly seen six times in this portion. The name of God used most often in the Hebrew Bible is YHWH[n 1] (י ה ו ה), also known as the Tetragrammaton (Greek for "four-letter [word]"). Hebrew is an abjad, so the word's letters Yōd, Hē, Vav, Hē are usually taken for consonants and expanded to Yahweh in English. The Tetragrammaton first appears in Genesis and occurs 6828 times in total in the Stuttgart edition of the Masoretic Text. It is thought to be an archaic third-person singular imperfect tense of the verb "to be" (i.e., "[He] was being"). This agrees with the passage in Exodus where God names Himself as "I Will Be What I Will Be" using the first-person singular imperfect tense. El appears in Ugaritic, Phoenician and other 2nd and 1st millennium BCE texts both as generic "god" and as the head of the divine pantheon. In the Hebrew Bible El (Hebrew: אל) appears very occasionally alone (e.g. Genesis 33:20, el elohe yisrael, "El the God of Israel", and Genesis 46:3, ha'el elohe abika, "El the God of thy father"), but usually with some epithet or attribute attached (e.g. El Elyon, "Most High El", El Shaddai, "El of Shaddai", El `Olam "Everlasting El", El Hai, "Living El", El Ro'i "El my Shepherd", and El Gibbor "El of Strength"), in which cases it can be understood as the generic "god". In theophoric names such as Gabriel ("Strength of God"), Michael ("Who is like God? "), Raphael ("God's medicine"), Ariel ("God's lion"), Daniel ("God's Judgment"), Israel ("one who has struggled with God"), Immanuel ("God is with us"), and Ishmael ("God Hears"/"God Listens") it is usually interpreted and translated as "God", but it is not clear whether these "el"s refer to the deity in general or to the god El in particular. A common name of God in the Hebrew Bible is Elohim (Hebrew: אלהים (help·info)‎). Despite the -im ending common to many plural nouns in Hebrew, the word Elohim when referring to God is grammatically singular, and takes a singular verb in the Hebrew Bible. The word is identical to the usual plural of el meaning gods or magistrates, and is cognate to the 'lhm found in Ugaritic, where it is used for the pantheon of Canaanite gods, the children of El and conventionally vocalized as "Elohim" although the original Ugaritic vowels are unknown. When the Hebrew Bible uses elohim not in reference to God, it is plural (for example, Exodus 20:2). There are a few other such uses in Hebrew, for example Behemoth. In Modern Hebrew, the singular word ba'alim ("owner") looks plural, but likewise takes a singular verb. A number of scholars have traced the etymology to the Semitic root *yl, "to be first, powerful", despite some difficulties with this view. Elohim is thus the plural construct "powers". Hebrew grammar allows for this form to mean "He is the Power (singular) over powers (plural)", just as the word Ba'alim means "owner" (see above). "He is lord (singular) even over any of those things that he owns that are lordly (plural)." The Jewish grammarians call such plurals … plur. virium or virtutum; later grammarians call them plur. excellentiae, magnitudinis, or plur. maiestaticus. This last name may have been suggested by the we used by kings when speaking of themselves (compare 1 Maccabees 10:19 and 11:31); and the plural used by God in Genesis 1:26 and 11:7; Isaiah 6:8 has been incorrectly explained in this way). It is, however, either communicative (including the attendant angels: so at all events in Isaiah 6:8 and Genesis 3:22), or according to others, an indication of the fullness of power and might implied. It is best explained as a plural of self-deliberation. The use of the plural as a form of respectful address is quite foreign to Hebrew. Mark S. Smith has cited the use of plural as possible evidence to suggest an evolution in the formation of early Jewish conceptions of monotheism, wherein references to "the gods" (plural) in earlier accounts of verbal tradition became either interpreted as multiple aspects of a single monotheistic God at the time of writing, or subsumed under a form of monolatry, wherein the god(s) of a certain city would be accepted after the fact as a reference to the God of Israel and the plural deliberately dropped. The plural form ending in -im can also be understood as denoting abstraction, as in the Hebrew words chayyim ("life") or betulim ("virginity"). If understood this way, Elohim means "divinity" or "deity". The word chayyim is similarly syntactically singular when used as a name but syntactically plural otherwise. In many of the passages in which elohim occurs in the Bible it refers to non-Israelite deities, or in some instances to powerful men or judges, and even angels (Exodus 21:6, Psalms 8:5) as a simple plural in those instances. Elohai or Elohei ("My God") is a form of Elohim along with the first-person singular pronoun enclitic. It appears in the names "God of Abraham" (Elohai Avraham); "God of Abraham, Isaac, and Jacob" (Elohai Avraham, Elohai Yitzchak ve Elohai Yaʿaqov); and "God of Sarah, Rebecca, Leah, and Rachel" (Elohai Sara, Elohai Rivka, Elohai Leah ve Elohai Rakhel). El Shaddai (Hebrew: אל שדי (help·info)‎, pronounced [ʃaˈda.i]) is one of the names of God in Judaism, with its etymology coming from the influence of the Ugaritic religion on modern Judaism. El Shaddai is conventionally translated as "God Almighty". While the translation of El as "god" in Ugarit/Canaanite language is straightforward, the literal meaning of Shaddai is the subject of debate. Tzevaot, Tsebaoth or Sabaoth (צבאות, [tsvaot] ( listen), lit. "Armies") appears in reference to armies or armed hosts of men in Exodus and Isaiah but is not used as a divine epithet in the Torah, Joshua, or Judges. In the First Book of Samuel, David uses the name YHWH Tzavaot and immediately glosses it as "the God of the armies of Israel". The same name appears in the prophets along with YHWH Elohe Tzevaot, Elohey Tzevaot, and Adonai YHWH Tzevaot. These are usually translated in the King James Version as the "Lord of Hosts" or "Lord God of Hosts". In its later uses, however, it often denotes God in His role as leader of the heavenly hosts. The jewish word Sabaoth was also absorbed in Ancient Greek (σαβαωθ, sabaoth) and Latin (Sabaoth, with no declination). Tertullian and other patristics used it with the meaning of Army of angels of God. The abbreviated form Jah (/dʒɑː/) or Yah (/jɑː/ ( listen); יהּ, Yahu) appears in the Psalms and Isaiah. It is a common element in Hebrew theophoric names such as Elijah and also appears in the forms yahu ("Jeremiah"), yeho ("Joshua"), and yo ("John", ultimately from the biblical "Yohanan"). It also appears 24 times in the Psalms as a part of Hallelujah ("Praise Jah"). 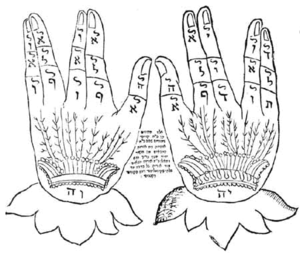 Shefa Tal - A Kabbalistic explanation of the Priestly Blessing with Adonai inscribed. Adonai (אֲדֹנָי, lit. "My Lords") is the plural form of adon ("Lord") along with the first-person singular pronoun enclitic. [n 3] As with Elohim, Adonai's grammatical form is usually explained as a plural of majesty. In the Hebrew Bible, it is nearly always used to refer to God (approximately 450 occurrences). As pronunciation of the Tetragrammaton came to be avoided in the Hellenistic period, Jews may have begun to drop the Tetragrammaton when presented alongside Adonai and subsequently expand it to cover for the Tetragrammaton in the forms of spoken prayer and written scripture. Owing to the expansion of chumra (the idea of "building a fence around the Torah"), Adonai itself has come to be too holy to say for Orthodox Jews, leading to its replacement by HaShem ("The Name"). Deuteronomy 10:17 has the proper name Yahweh alongside the superlative constructions "God of gods" elōhê ha-elōhîm and "Lord of lords" adōnê ha-adōnîm (כִּי יְ ה וָ ה אֱלֹֽהֵיכֶם הוּא אֱלֹהֵי הָֽאֱלֹהִים וַאֲדֹנֵי הָאֲדֹנִים ; KJV: "For the LORD your God is God of gods, and Lord of lords"). The final syllable of Adonai uses the vowel kamatz, rather than patach which would be expected from the Hebrew for "my lord(s)". Prof. Yoel Elitzur explains this as a normal transformation when a Hebrew word becomes a name, giving as other examples Nathan, Yitzchak, and Yigal. Up until the mid-twentieth century, the use of the word Adoshem, combining the first two syllables of "Adonai" with the last syllable of "Hashem"', was quite common. This was discouraged by Rabbi David HaLevi Segal in his commentary to the Shulchan Aruch. His rationale was that it is disrespectful to combine a Name of God with another word. It took a few centuries for the word to fall into almost complete disuse. Despite being obsolete in most circles, it is used occasionally in conversation in place of Adonai by Jews who do not wish to say Adonai but need to specify the substitution of that particular word. It is also used when quoting from the liturgy in a non-liturgical context, especially as a substitute in musical pieces where a replacement for "Adonai" must have the same number of syllables. For example, Shlomo Carlebach performed his prayer "Shema Yisrael" with the words Shema Yisrael Adoshem Elokeinu Adoshem Eḥad instead of Shema Yisrael Adonai Eloheinu Adonai Eḥad. "It will come about in that day," declares the Lord, "That you will call Me Ishi[n 6] And will no longer call Me Baali." The word ehyeh is the first-person singular imperfect form of hayah, "to be", usually translated into English as "I will be". Because Classical Hebrew had an aspectual system rather than grammatical tense, in which the imperfect denotes any actions that are not yet completed, the verb form ehyeh can be translated as "I am/I am being/I will be" (e.g. Exodus 3:12, "Certainly I will be [ehyeh] with thee."). Although Ehyeh asher ehyeh is generally rendered in English "I am that I am", better renderings might be "I will be what I will be" or "I will be who I will be", or "I shall prove to be whatsoever I shall prove to be" or even "I will be because I will be". Other renderings include: Leeser, “I Will Be that I Will Be”; Rotherham, "I Will Become whatsoever I please", New World Translation (2013 Edition): "I Will Become What I Choose to Become." Greek, Ego eimi ho on (ἐγώ εἰμι ὁ ὤν), "I am The Being" in the Septuagint, and Philo, and Revelation or, "I am The Existing One"; Lat., ego sum qui sum, "I am Who I am." The word asher is a relative pronoun whose meaning depends on the immediate context, so that "that", "who", "which", or "where" are all possible translations of that word. Elah (Aramaic: אֱלָה; pl. "elim") is the Aramaic word for God. The origin of the word is uncertain and it may be related to a root word, meaning "reverence". Elah is found in the Tanakh in the books of Ezra, Jeremiah (Jer 10:11, the only verse in the entire book written in Aramaic), and Daniel. Elah is used to describe both pagan gods and the Jews' God. The word 'Elah - إله' is also an Arabic word which means god. The name is etymologically related to Allah الله used by Muslims. In the Book of Genesis, Hagar is said to call the name of Yahweh who spoke to her through his angel. In Hebrew, her phrase "El Roi" is taken as an epithet of God ("God of Seeing") although the King James Version translates it as a statement: "Thou God seest me." The name Elyon (Hebrew: עליון) occurs in combination with El, YHWH, Elohim and alone. It appears chiefly in poetic and later Biblical passages. The modern Hebrew adjective "`Elyon" means "supreme" (as in "Supreme Court") or "Most High". El Elyon has been traditionally translated into English as 'God Most High'. The Phoenicians used what appears to be a similar name for God, one that the Greeks wrote as Έλιον. It is cognate to the Arabic `Aliyy. "The Eternal One" is increasingly used, particularly in Reform and Reconstructionist communities seeking to use gender-neutral language. In the Torah, "Hashem Kel Olam" ("the Everlasting God") is used at Genesis 21:33 to refer to God. "HaShem" redirects here. For other people with similar names, see Hashem. It is common Jewish practice to restrict the use of the names of God to a liturgical context. In casual conversation some Jews, even when not speaking Hebrew, will call God HaShem (השם), which is Hebrew for "the Name" (cf. Leviticus 24:11 and Deuteronomy 28:58). Likewise, when quoting from the Tanakh or prayers, some pious Jews will replace Adonai with HaShem. For example, when making audio recordings of prayer services, HaShem will generally be substituted for Adonai. A popular expression containing this phrase is Baruch HaShem, meaning "Thank God" (literally, "Blessed be the Name"). Talmudic authors, ruling on the basis of Gideon's name for an altar ("YHVH-Shalom", according to Judges 6:24), write that "the name of God is 'Peace'" (Pereq ha-Shalom, Shab. 10b); consequently, a Talmudic opinion (Shabbat, 10b) asserts that one would greet another with the word shalom (help·info) in order for the word not to be forgotten in the exile. But one is not permitted to greet another with the word shalom (help·info) in unholy places such as a bathroom, because of holiness of the name. Shekhinah ( שכינה (help·info)) is the presence or manifestation of God which has descended to "dwell" among humanity. The term never appears in the Hebrew Bible; later rabbis used the word when speaking of God dwelling either in the Tabernacle or amongst the people of Israel. The root of the word means "dwelling". Of the principal names of God, it is the only one that is of the feminine gender in Hebrew grammar. Some believe that this was the name of a female counterpart of God, but this is unlikely as the name is always mentioned in conjunction with an article (e.g. : "the Shekhina descended and dwelt among them" or "He removed Himself and His Shekhina from their midst"). This kind of usage does not occur in Semitic languages in conjunction with proper names. And (further) their Prophet said to them: "A Sign of his authority is that there shall come to you the Ark of the Covenant, with (an assurance) therein of security from your Lord, and the relics left by the family of Moses and the family of Aaron, carried by angels. In this is a Symbol for you if ye indeed have faith." Adon Olam – "Master of the World"
Aleim – sometimes seen as an alternative transliteration of Elohim, A'lim "عليم" in Arabic means who intensively knows, A'alim "عالم" means who knows, the verb is A'lima علم means " knows ", while Allahumma "اللهم" in Arabic equals to "O'God" and used to supplicate him for something. Aravat (or Avarat) – "Father of Creation"; mentioned once in 2 Enoch, "On the tenth heaven is God, in the Hebrew tongue he is called Aravat". Avinu Malkeinu (help·info) – "Our Father, Our King"
Bore (help·info) – "The Creator"
Dibbura or Dibbera - "The Word (The Law)" - used primarily in the Palestinian Targums of the Pentateuch (Aramaic); e.g. Num 7:89, The Word spoke to Moses from between the cherubim in the holy of holies. Ehiyeh sh'Ehiyeh – "I Am That I Am": a modern Hebrew version of "Ehyeh asher Ehyeh"
El ha-Gibbor – "God the Hero" or "God the Strong" or "God the Warrior". Allah jabbar "الله جبار" in Arabic means "the God is formidable and invincible"
HaKadosh, Barukh Hu (Hebrew); Kudsha, Brikh Hu (Aramaic); تبارك القدوس (Arabic) – "The Holy One, Blessed Be He"
Kadosh Israel – "Holy One of Israel"
Magen Avraham – "Shield of Abraham"
Malbish Arumim – "Clother of the Naked"
Matir Asurim – "Freer of the Captives"
Mechayeh Metim – "Life giver to the Dead"
Melech HaMelachim – "The King of Kings" or Melech Malchei HaMelachim "The King, King of Kings", to express superiority to the earthly rulers title. Arabic version of it is مالك الملك (Malik al-Mulk). Melech HaOlam – "The King of the World"
Mi She'amar V'haya Ha`olam - "He who spoke, and the world came into being." Oseh Shalom – "Maker of Peace"
Pokeach Ivrim – "Opener of Blind Eyes"
Ro'eh Yisra'el – "Shepherd of Israel"
Rofeh Cholim – "Healer of the Sick"
Somech Noflim – "Supporter of the Fallen"
Tzur Israel – "Rock of Israel"
Yotsehr 'Or – "Fashioner of Light"
Zokef kefufim – "Straightener of the Bent"
The Psalms in Hebrew and Latin. Manuscript on parchment, 12th century. In Jewish tradition the sacredness of the divine name or titles must be recognized by the professional sofer (scribe) who writes Torah scrolls, or tefillin and mezuzah. Before transcribing any of the divine titles or name he prepares mentally to sanctify them. Once he begins a name he does not stop until it is finished, and he must not be interrupted while writing it, even to greet a king. If an error is made in writing it may not be erased, but a line must be drawn round it to show that it is canceled, and the whole page must be put in a genizah (burial place for scripture) and a new page begun. The seventy-two-lettered name is derived from three verses in Exodus (14:19–21) beginning with "Vayyissa", "Vayyabo" and "Vayyet" respectively. Each of the verses contains 72 letters, and when combined they form 72 names, known collectively as the Shemhamphorasch. The kabbalistic book Sefer Yetzirah explains that the creation of the world was achieved by the manipulation of these sacred letters that form the names of God. The words "God" and "Lord" are written by some Jews as "G-d" and "L-rd" as a way of avoiding writing any name of God in full out of respect. Deuteronomy 12:3–4 reads, "And ye shall overthrow their altars, and break their pillars, and burn their groves with fire; and ye shall hew down the graven images of their gods, and destroy the names of them out of that place. Ye shall not do so unto the Lord your God." From this it is understood that one should not erase or blot out the name of God. The general halachic opinion is that this only applies to the sacred Hebrew names of God, but not to other euphemistic references; there is a dispute whether the word "God" in English or other languages may be erased or whether Jewish law and/or Jewish custom forbids doing so, directly or as a precautionary "fence" about the law. The hyphenated version of the English name ("G-d") can be destroyed, so by writing that form, religious Jews prevent documents in their possession with the unhyphenated form from being destroyed later. Alternatively, a euphemistic English reference such as "Hashem" (literally, "the Name") may be substituted, or an abbreviation thereof, such as B''H (B'ezrat Hashem, literally, "By the blessing of the Name"). This issue is most controversial in the context of the United States Motto, "In God We Trust", which has been minted or printed since its first appearance in 1864 without hyphenation. While many Jews will write the name "God" in English, others will not, or only under special circumstances. By comparison, Israel struck down efforts to enshrine an allusive reference to God (בה, literally "B H", an abbreviation of the allusion "Blessed by the Name") on modern Israeli currency in 2002, 2003, and 2009. The frequency of currency destruction was considered too high for Israelis to tolerate the name of God being printed or minted on Israeli banknotes or coins and subsequently destroyed. According to Talmudic Tractate Rosh Hashana (18B4), Jews in the times of the Hasmonean Kingdom were "weaned off" the practice of writing the name of Heaven by the Sages, arguing that such documents could be disposed of thoughtlessly. The day the Sages succeeded in weaning the people off the practice was celebrated as a holiday in ancient Israel on the Third of Tishrei, a date now dedicated to the Fast of Gedaliah, which is conceptually related, as it establishes that "the death of the righteous is likened to the burning of the House of our G-d". ^ The Tetragrammaton is also sometimes transcribed as YHVH or JHVH. ^ The World English Bible translation: "Behold, Boaz came from Bethlehem, and said to the reapers, "Yahweh be with you." They answered him, "Yahweh bless you." The book is traditionally ascribed to the prophet Samuel who lived in the 11th & 10th centuries BCE. A date of the 6th or 5th century BCE for the passage is, however, more common among subscribers to the Documentary Hypothesis regarding the development of the biblical canon. ^ Gesenius: "124i Further, אֲדֹנִים, as well as the singular אָדוֹן, (lordship) lord, e.g. אֲדֹנִים קָשֶׁה a cruel lord, Is 194; אֲדֹנֵי הָאָ֫רֶץ the lord of the land, Gn 4230, cf. Gn 3219; so especially with the suffixes of the 2nd and 3rd persons אֲדֹנֶ֫יךָ, אֲדֹנַ֫יִךְ ψ 4512, אֲדֹנָיו, &c., also אֲדֹנֵ֫ינוּ (except 1 S 1616); but in 1st sing. always אֲדֹנִי. So also בְּעָלִים (with suffixes) lord, master (of slaves, cattle, or inanimate things; but in the sense of maritus, always in the singular), e.g. בְּעָלָיו Ex 2129, Is 13, &c."
^ The American pronunciation is usually the same but some speakers prefer variants closer to the original sound, such as /bɑːˈɑːl, bɑːl/. ^ The half ring ⟨ ʿ ⟩ or apostrophe ⟨ ' ⟩ in the name Baʿal marks the original words' glottal stop, a vocalization which appears in the middle of the English word "uh-oh". ^ "Yahweh - Translation, Meaning, & Facts". Encyclopedia Britannica. ^ Maimonides. Mishneh Torah, Yesodei ha-Torah §6:2. ^ EJ (2005), p. 179. ^ Rich, Tracey R. (1996), "The Name of G-d", Judaism 101, retrieved 31 Aug 2015 . ^ a b Maimonides. "Yesodei ha-Torah - Chapter 6". Mishneh Torah - Sefer Madda. Translated by Eliyahu Touger. Chabad.org. Retrieved 2017-08-10. ^ Rabbi Ishmael, Sanh., 66a. ^ Byrne, Máire (2011), The Names of God in Judaism, Christianity, and Islam: A Basis for Interfaith Dialogue, A&C Black, p. 24 . ^ Harris, Stephen L. (1985), Understanding the Bible: A Reader's Introduction, 2nd ed., Palo Alto: Mayfield, p. 21 . ^ Gordon, Nehemia, "The Pronunciation of the Name" (PDF), The Karaite Korner, retrieved 5 June 2015 . ^ a b Exod. 3:14. ^ "The Tetragrammaton—The Unpronounceable Four-Letter Name of God", My Jewish Learning, retrieved 17 September 2014 . ^ "Hebrew Name for God—Adonai", Hebrew for Christians, retrieved 21 May 2014 . ^ Origen, Commentary on Psalms 2:2. ^ see Larry W. Hurtado, “God or Jesus? Textual Ambiguity and Textual Variants in Acts of the Apostles,” in Texts and Traditions: Essays in Honour of J. Keith Elliott, eds. Peter Doble and Jeffrey Kloha. Leiden/Boston: Brill, 2014. Pp. 239-54. ^ K. van der Toorn, Bob Becking, Pieter Willem van der Horst, "Dictionary of deities and demons in the Bible", pp.274-277. Books.google.com.au. 1999. ISBN 9780802824912. Retrieved 2011-12-05. ^ K. van der Toorn, Bob Becking, Pieter Willem van der Horst, "Dictionary of deities and demons in the Bible", pp.277-279. Books.google.com.au. 1999. ISBN 9780802824912. Retrieved 2011-12-05. ^ Mark S. Smith (2008). God in Translation: Deities in Cross-Cultural Discourse in the Biblical World. Coronet Books Incorporated. p. 15. ISBN 9783161495434. Retrieved 2011-12-05. ^ Exod. 6:26, 7:4, 12:41. ^ Oxford English Dictionary, 1st ed. "Jah, n." Oxford University Press (Oxford), 1900. ^ Is. 12:2, 26:4, & 38:11. ^ "Lord", International Standard Bible Encyclopedia, p. 157 . ^ "Adonai and Adoni (Psalm 110:1)", Focus on the Kingdom, Restoration Fellowship, retrieved 5 June 2015 . ^ "Psalm 136:3 (NASB)". Blue Letter Bible. ^ Yoel Elitzur, Shemot HaEl VeTaarichei Ketivat Sifrei HaMiqra, published in Be'einei Elohim VaAdam, Beit Morasha Jerusalem: 2017, p 407 footnote 24; see also link. ^ Oxford English Dictionary (1885), "Baal, n."
^ Oxford Dictionaries (2015), "Baal"
^ a b Merriam-Webster Online (2015), "baal". ^ Webb's Easy Bible Names Pronunciation Guide (2012), "Baal". ^ Cleghorn & al. (2011), p. 87. ^ Herrmann (1999), p. 132. ^ DULAT (2015), "bʕl (II)". ^ a b BEWR (2006), "Baal". ^ a b Encyclopaedia Judaica, 2nd ed., Vol. VII, p. 675 . ^ Uittenbogaard, Arie, Ishi | The amazing name Ishi : meaning and etymology, Abarim Publications, retrieved 21 May 2014 . ^ a b Seidner, 4. ^ New World Translation of the Holy Scriptures, Watchtower Bible and Tract Society of New York, Inc. Exodus 3:14 footnote, "Exodus 3:14 NWT". ^ The Divine Name in the Hebrew Scriptures "NWT 2013 Appendix A". ^ "Exodus 3:14 LXX". Bibledatabase.net. Retrieved 2014-05-21. ^ Matthew Berke, GOD AND GENDER IN JUDAISM, First Things, June 1995; Mel Scult, The Radical American Judaism of Mordecai M. Kaplan, Indiana University Press, 2013. p. 195. ^ Greenbaum, Elisha. "Thank G-d!". Chabad.org. Retrieved 15 February 2015. ^ "H46 - 'abiyr - Strong's Hebrew Lexicon (KJV)". Blue Letter Bible. Retrieved 20 November 2017. ^ "H117 - 'addiyr - Strong's Hebrew Lexicon (KJV)". Blue Letter Bible. Retrieved 21 November 2017. ^ Encyclopaedia Judaica, 2nd ed., Vol. VI, Keter Publishing House, p. 232 . ^ "Shaimos guidelines". Shaimos.org. Archived from the original on 2011-12-27. Retrieved 2011-12-05. Britannica Encyclopedia of World Religions, New York: Encyclopædia Britannica, 2006, ISBN 978-1-59339-491-2 . Diccionario de la Lengua Ugarítica, 3rd ed., Leiden: translated from the Spanish for E.J. Brill as A Dictionary of the Ugaritic Language in the Alphabetic Tradition (Ser. Handbuch der Orientalistik [Handbook of Oriental Studies], Vol. 112), 2015, ISBN 978-90-04-28864-5 . "Names of God", Encyclopedia of Judaism, Infobase Publishing, 2005, p. 179, ISBN 0816069824 . The Zondervan Pictorial Bible Dictionary, Grand Rapids: Zondervan Publishing House, 1963, ISBN 978-0310235606 . Cleghorn, T.L. ; et al. (2011), Comprehensive Articulatory Phonetics: A Tool for Mastering the World's Languages, 2nd ed., ISBN 978-1-4507-8190-9 . Herrmann, Wolfgang (1999), "Baal", Dictionary of Deities and Demons in the Bible, 2nd ed., Grand Rapids: Wm. B. Eerdmans Publishing, pp. 132–139 . Pope, Marvin H. (2006), "Baal Worship", Encyclopaedia Judaica, 2nd ed., Vol. III, New York: Thomas Gale, ISBN 978-0028659282 . The Name of God as Revealed in Exodus 3:14—an explanation of its meaning. R. Clover. "The Sacred Name Yahweh". Qadesh La Yahweh Press. Archived from the original on June 15, 2007.